Your mouth is a mess. Even if you have impeccable oral hygiene habits, fighting the bacteria and toxins that our mouths develop or are exposed to every single day is a constant battle. But it’s a battle that can be won without resorting to chemicals or artificial solutions. At Assure a Smile, we believe that you don’t need to add any more toxins to your body when you are already bombarded with so many on a daily basis. Our holistic approach to dentistry includes a focus on effective, natural oral hygiene solutions that increase overall wellness while reducing unnecessary and harmful foreign contaminants from the body. We apply only biocompatible materials and non-toxic therapies to diagnose and treat oral cavity ailments, eliminating the risk of fluoride-related disorders and mercury poisoning. If you are looking to boost your oral hygiene while still maintaining a balanced, natural lifestyle, these four ideas can play key roles in your wellness journey. Put 1-2 teaspoons of coconut or sesame oil in the mouth. Give the oil time to melt and thin out while holding it in your mouth. Once warm and thin, swish the oil throughout your teeth and gums for no more than 20 minutes. Spit the entire contents of your mouth— both oil and saliva— into the trashcan or empty bottle (spitting into a sink or toilet might cause blockages). Rinse with warm water, spitting remaining oil into a trashcan or empty bottle. For decades, silver fillings (also called dental amalgam) were commonly used as a dental amalgam. But these fillings were prepared with liquid mercury, which has since been determined to be extremely hazardous to our health. In fact, patients with silver fillings have significantly higher risks of developing serious chronic illnesses and disorders. That’s why more and more patients who have such fillings are choosing to have them removed and replaced with a natural, non-toxic alternative. At Assure A Smile, we not only prohibit mercury use in the office, but also safely remove mercury fillings from patients who received this hazardous material from other dentists in the past. While a common procedure, mercury filling removal must be performed with extreme caution to avoid unnecessary and dangerous exposure to mercury vapor and amalgam fragments. Patients should make an appointment with an experienced mercury removal dentist to ensure health complications do not arise during the procedure. When considering healthy oral hygiene, we rightly spend a great deal of time focusing on tooth and gum care. But in doing so, it can be easy to neglect an element that is quite literally central to maintaining a healthy mouth: the tongue. Our tongues are breeding grounds for bacteria and voracious collectors of food debris, dead cells, and toxins, all of which can negatively impact our health if left unaddressed. A tongue scraper is a simple solution to this problem which is inexpensive, readily available, and both easy and painless to use. Reducing bad breath. If you have a bad taste in your mouth, it’s probably on your tongue. Tongue scraping can help eliminate halitosis by reducing the volatile sulfur compounds (VSC) on the tongue that lead to bad breath. Preventing cavities and reducing plaque. Tongue scraping can reduce levels of streptococcus mutans and lactobacillus in the mouth, thus reducing the incidence of cavities and development of plaque. Increasing cardiovascular and respiratory health. 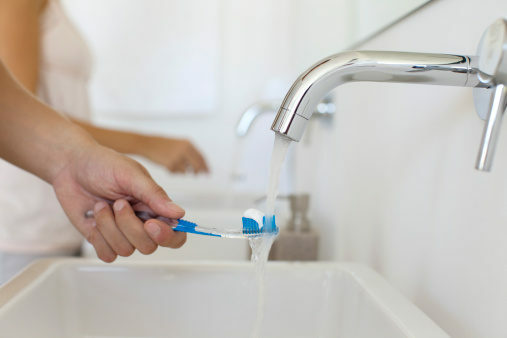 An increasing number of studies have shown a connection between oral hygiene and conditions that develop far from the mouth, such as heart disease or respiratory infections. Bacteria in the mouth can cause inflammation there, which in turn can increase harmful inflammation elsewhere in the body, including in the arteries. Bacteria on your tongue can also increase the risk of respiratory infection and pulmonary disease if that bacteria travels to the lungs. Tongue scraping reduces the amount of inflammation-causing bacteria and can reduce the risk of further infection and inflammation. This can include the elimination of processed foods and the adoption of an alkaline and sugar-free diet to help reduce bacterial growth and the acidity of saliva, both of which are major causes of tooth decay. At Assure A Smile, we partner with our patients to help them develop healthy, natural, and effective oral hygiene habits as part of an overall wellness strategy and holistic healthcare approach. To learn more about the importance of holistic healthcare and how to develop healthier habits for a better you, please contact us today at 305-274-0047.